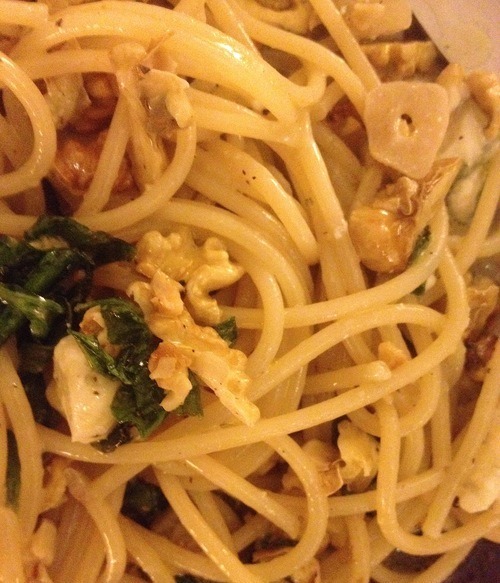 Since I saw them in the grocer a few days ago, I have been thinking about making pasta with some fresh walnuts and garlic and finally had the occasion today. Extracting the nuts is pretty fiddly when they are so young, but sometimes it’s meditative to do such a task – and sometimes, it’s not – but heck, it was more or less worth the effort. Roquefort and these fresh walnuts both hail from the same area in southern France, and work well together – a very small crumbling of the blue cheese at the end adds a satisfying bite of acidity. Really though, do not add too much, as it’s very powerful and will drown out the other flavours if used excessively. Prepare the nuts, and bring pasta water to the boil with a good amount of salt. Cook the pasta. Meanwhile, place the garlic in the olive oil, while still cold. Turn on heat and cook gently until aromatic. Add the walnuts and cook gently for a few minutes. Add the celery leaves, cook for a few minutes gently. Add a few tablespoons of pasta cooking water to the walnut mix to loosen it up, and make it go further. Season with salt and pepper. Mix with the spaghetti. Serve with roquefort on top. 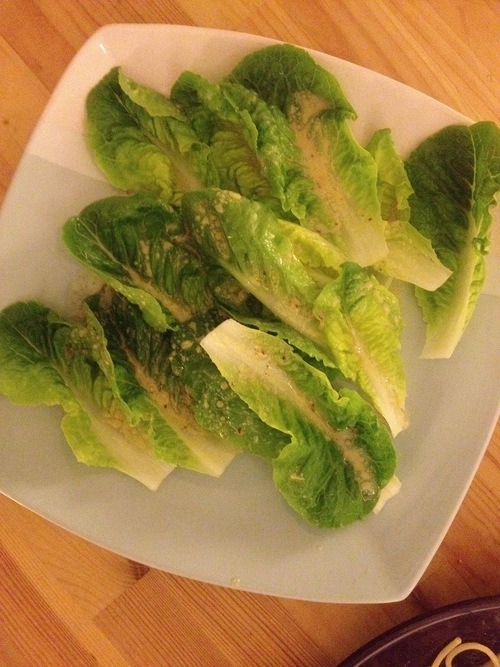 A gem lettuce salad with Dijon dressing.